The list of sites I want to make seems to be ten times longer than the ones I've actually managed to complete. I'm hoping to change this, which is why I've taken great care to select what subjects I want to focus on. All of these projects are for subjects that are near and dear to my heart, some from my childhood and others more recently catching my interest. I'd like to make all of them at some point, but for now you can get a good idea of what's to come in the future. They're not listed in any particular order either! Overthesky.org is my domain for all of my upcoming sites dedicated to the series, Tenkuu no Escaflowne (also known as Vision of Escaflowne). 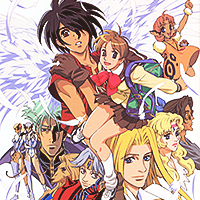 Escaflowne is, in my opinion, one the greatest anime series to come out of Japan. It wraps up action, mystery, intrigue, romance, a wonderfully composed musical score, and fantastic animation all into one show. I don't know if I have an extensive enough vocabulary to properly express how much this series means to me or why it's been my favorite for almost 15 years, but this domain will be my attempt to try to do just that. There will be smaller tributes to the characters and relationships here at a later date, but for now it serves as a home for my fanlistings related to the series. It's worth noting that this is the one project I've consistently worked on in bits and pieces since 2006, which only goes to show how it left an everlasting impression on me. This is probably my highest priority site in terms of which I'd want to complete first, and it's also going to be the most grandeur due to the subject matter. Sites Planned for the Domain: Escaflowne series shrine, Van Fanel shrine, Hitomi Kanzaki shrine, Van & Hitomi relationship shrine, Music of Escaflowne shrine, a multimedia shrine with screencaps, manga and doujinshi scans, and artbooks from my own personal collection, as well as an assortment of fanlistings related to the series. GalaxyChord is one of my future planned shrine for Usagi Tsukino of the shoujo series Bishoujo Senshi Sailor Moon. Whenever I start listing off my favorite characters, Usagi is one those who comes to mind immediately. I've been a fan of the series since my elementary school days, and over the years I've spent a lot of time analyzing and considering various aspects of it. As the main character, you'd automatically assume that Usagi gets the most love - and to be fair, she does get a lot of it. But one thing that's always bothered me is how the characteristics people tend to remember are the ones I feel are the most surface level. She's such a complex character, one who has just as many faults as she does strengths. She goes through a ton of development over the course of the series, and a lot of these changes are subtle or less focused on than others. It's this complexity that makes her endearing, timeless and truly beautiful to me. I want to focus on her character during the last season Sailor Stars primarily, but it will also just be my attempt to make a shrine that gives love to one of the most beautiful females in anime today. Although it's currently Untitled, that doesn't make this project any less important than the others. In fact, this might be one of my more personal projects, seeing as how I'm such a huge fan of anime from the 1990s. (Thought to be fair, it might include a handful of series from the early 2000s too.) Overtime, I have found that more often that not, many of the series I grew up with have become a distant memory for most. (Like Tenchi Muyo or Outlaw Star.) Or they've never even been heard of, which is such a shame. (Such as my beloved Magic Knight Rayearth or Sorcerous Stabber Orphen.) There are so many unique and truly entertaining series from that period of time, which is why I plan to make a mini shrine that showcases them. My plan is to write up some basic information about the series and characters, interesting factoids and then to provide a quick list of why the series is (or isn't) something you (the reader) might enjoy. I hope to watch a series in one swoop, and then write it up while it's still freshly on my mind. This project has the potential to turn into something rather large, but I'm looking to make it clean and interesting.